On the Edge was performed again in 2014. Look for it as part of Maine Public Television's Community Film Series. I call On the Edge a "multi-genre arts and advocacy project." In 2012, artist Philip Steel of Southwest Harbor, Maine asked me to write the script for a project he wanted to do relating to the fishing islands of Maine. His idea took a while to explain! Like his two similar projects, Net Loss (2004) about the fishing harbors of Florida, and Fishing Gone (2009) about the watermen of Tangier Island in Chesapeake Bay, On the Edge began with a series of paintings of island, coastal, and working waterfront topics. With a couple dozen paintings as the basis for each project, Steel then seeks out a local writer to produce the script for a performance--usually a one-man show—that uses his paintings as both set and supporting cast to describes the difficulties, joys, and lifestyle of the shrinking American fishing communities. In the case of Net Loss and Fishing Gone, illustrated hardcover books were published containing the paintings and the complete text. With On the Edge, set on composite Maine island that could be any remote lobstering community, Steel completes his trilogy. We still hope to get the accompanying book published! 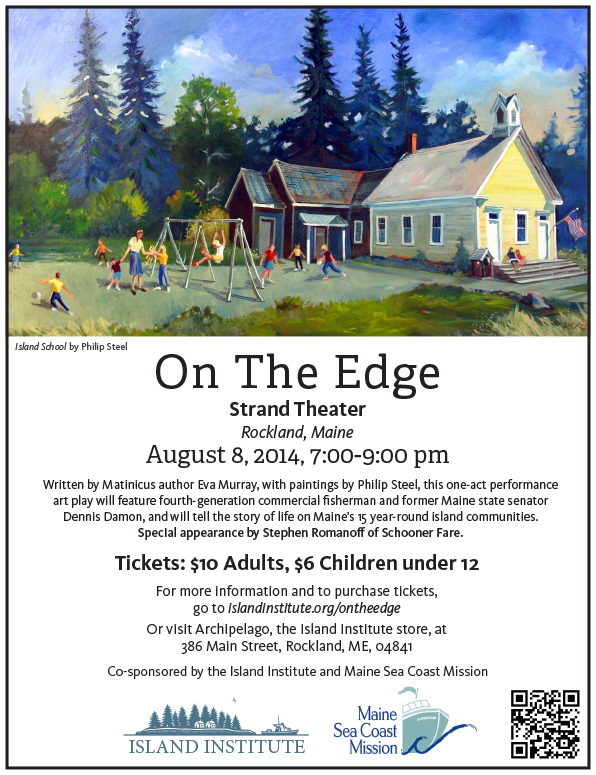 On the Edge was first performed in Northeast Harbor, Maine in August of 2013, and was filmed at that time by Maine filmmaker Jeff Dobbs. Our actor for those and for the 2014 Rockland, Maine performance was expert storyteller and former State Senator Dennis Damon, himself a former lobsterman from “down east.” Music was written and performed by Steve Romanoff of Schooner Fare, who adapted his song Kingfisher to serve as a wonderful introduction to the performance. Support was provided by the Island Institute and the Maine Sea Coast Mission.